One week after the first ever Shots Trust Shirt auction we are pleased to announce we raised over £1000 for Gary’s Playing Budget. The generosity of two Shots fans meant we were able to auction, via Shotsweb, a total of 27 shirts. Bids were placed over a 15 day period and the winners were announced on Friday 2nd Feb. 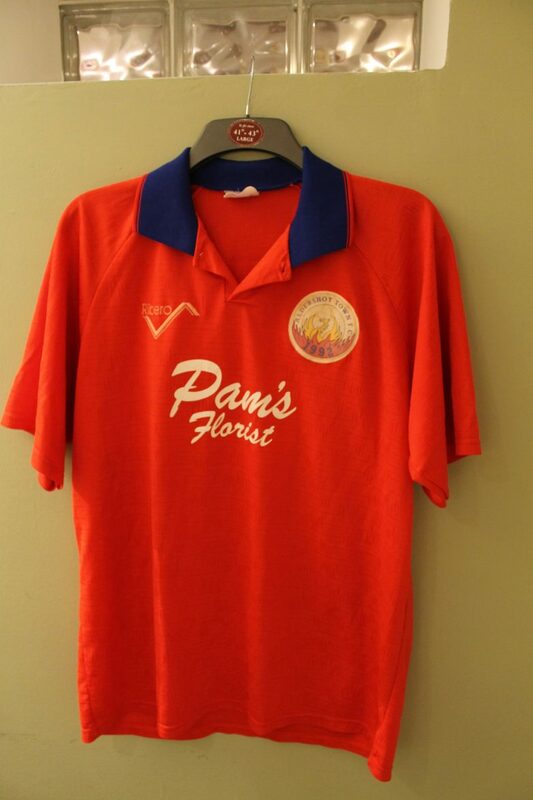 The largest single bid was £380 which was lodged by Sheffield Baz for Chris Tomlinsons’ number 5 shirt from our first ever ATFC season in 1992/93 (pictured here). Well done Baz ! Winners have been contacted and shirts have either been posted, collected or will be available at the Bromley match on Tuesday week. We will be located near the old Trust Cafe from 7.15pm until just before Kick Off for collection of remaining lots. This auction was a huge success and as such provisional plans are in place to repeat it, potentially in September 2018. If anyone has shirts they wish to donate then we are happy to collect and store until such time. Please email us on info@theshotstrust.co.uk.